(SAN DIEGO, CA) — While some breweries release new beers at such a rapid pace their patrons can barely keep up, Societe Brewing Company marches to the beat of its own drummer—a much slower beat. Long-time offerings are what primarily draw fans to (and back to) the San Diego brewery, with new beers debuting one-to-four times per year, making last weekend’s debut of a whopping five new beers even more special. (OK, one of the beers debuted in ultra-limited quantities in 2016, but this is the first time beer-lovers can take a bottle home.) The quintet—which includes a brand new India pale ale (IPA) and a wine barrel-aged “Feral” ale—is currently available at Societe’s tasting room at 8262 Clairemont Mesa Boulevard in the Kearny Mesa area of San Diego. THE FIDDLER | San Diego-style IPA (6.9%): Playing off lyrics from Alabama’s “If You’re Gonna Play in Texas”, brewmaster Travis Smith says, “If you’re gonna brew in San Diego, you gotta have an IPA!” Societe is highly regarded for its lengthy lineage of IPAs, and its latest harnesses the attributes of a trio of hops—Simcoe, Eureka and Idaho 7—to bring something new and unique to its Out West family of hop-driven beers. THE STATESMAN | Pale Ale (5.2%): Crafted to bring forth a distinctly West Coast hop profile balanced by substantial yet subtle malt character, this beer is a modern interpretation of an American pale ale and Societe’s first foray into this venerable beer style. THE BACHELOR with CASHMERE | Single-Hop IPA (6.5%): The latest in Societe’s rotating line of IPAs exploring the world’s hop varietals, this beer exclusively utilizes Cashmere hops, a recently developed, en vogue cross between the Cascade and Northern Brewer cultivars. THE DAMSEL | Belgian-style Table Beer (3.7%): This New World take on the lowest-alcohol variety of monastic, European “abbey ales” is crafted to be highly drinkable and light in body, but big on floral and spice character imparted by our house Belgian yeast strain. THE THIEF | Feral Ale with Locally Grown Grenache Blanc (6.3%): Grenache Blanc grapes harvested from North San Diego County’s Vesper Vineyards lend a brilliant vinous essence to this effervescent, layered and award-winning specialty ale, which is available in bottles for the first time. The Fiddler, The Statesman, The Bachelorette with Cashmere and The Damsel are available exclusively on draft, while The Thief is also on-sale in corked, caged, 500-millileter bottles. The only place to purchase Societe’s bottled beers is the brewery’s tasting room, but draft beers will be distributed to notable beer-centric bars and restaurants throughout San Diego County in the very near future. ABOUT SOCIETE BREWING COMPANY: A production brewery founded by a pair of professional brewers in 2012, Societe Brewing Company produces an array of almost-exclusively draught offerings ranging from hoppy “Out West” ales, to Belgian-inspired and continental “Old World” ales and lagers, and dark “Stygian” beers. The brewery also features a 1,500-square-foot, temperature-controlled room housing used wine barrels filled with a maturing stock of “Feral” (barrel-aged sour) ales, which are bottled and sold inSociete’s tasting room. Proud to be part of the hotbed of brewing innovation that is San Diego, California, Societe distributes its beers to finer bars and beer-centric restaurants and retailers throughout its home-county. The brewery has earned medals in multiple style categories at the Great American Beer Festival, World Beer Cup and San Diego International Beer Festival competitions, and its multifarious portfolio of year-round beers includes The Pupil and The Apprentice IPAs, The Coachman Really Small IPA, The Harlot Belgian Extra, The Pugilist Dry Stout and The Butcher Imperial Stout. 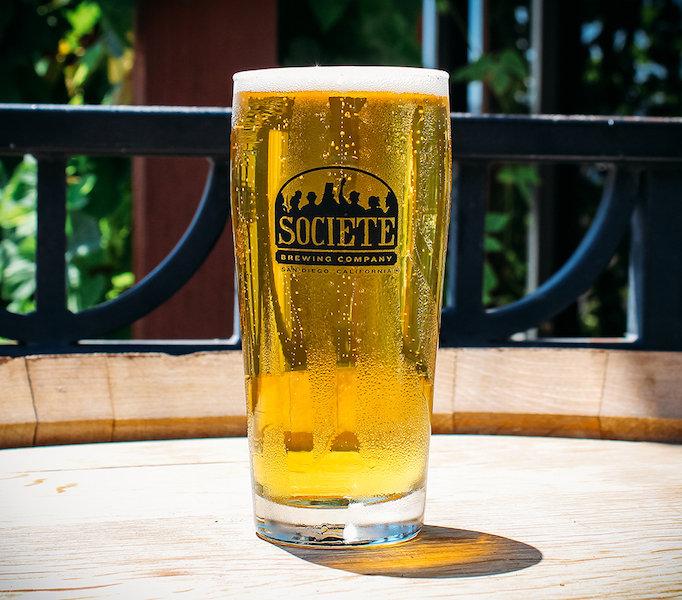 For more information, visit the company’s official website—www.societebrewing.com—or follow Societe via social media on Facebook, Twitter or Instagram (@societebrewing).